Cut the top off of each of the bread rolls and remove a large portion of the dough inside. Clean and peel the shrimp. In a saucepan over medium-low heat, melt the butter and add the olive oil. Add the garlic and then the shrimp. Stir lightly until the ingredients are well combined. Add the wine and salt and pepper, to taste. 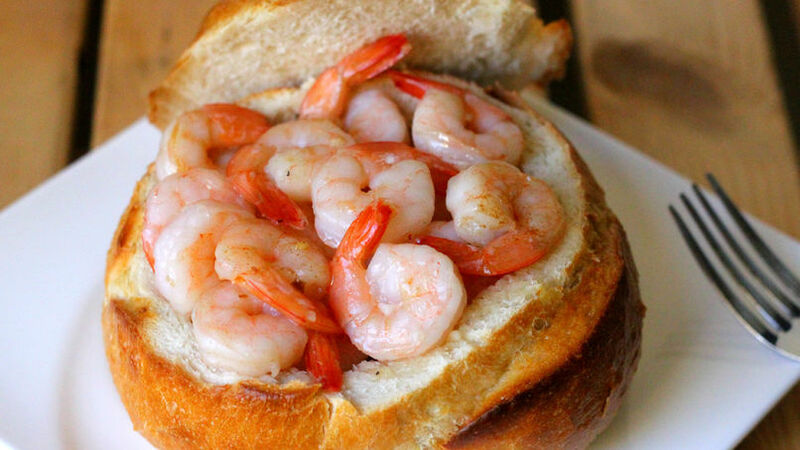 Fill each bread roll with shrimp and pour the sauce on top. If you want, you can sprinkle a bit of chopped parsley over the shrimp. You can add 1/2 a chile pepper or hot sauce to the recipe to give it a spicy kick. Garlic shrimp is a dish that takes me back to my childhood. I had the pleasure of tasting this dish as a little girl; little did I know then that it was one of the most popular tapas in the country! In time I learned to prepare it, and whenever I make it at home the aroma from the butter and garlic takes me back to my memories of Spain. Today I took the traditional recipe and decided to serve it inside a soft sourdough bread bowl. The result? Literally finger-licking good!